This salad requires very little cooking and effort yet it packs a tasty punch, thanks to the fresh chilli, rocket, sesame seeds and the oil-free dressing, which keeps the flavours fresh. Edamame beans can be swapped for baby broad beans, if you prefer. 1. Cook the noodles in a pan of boiling water for 10 minutes, until tender. Cool under running water and drain well. 2. 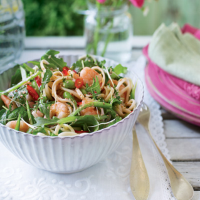 Place the noodles in a large bowl and toss with the prawns, edamame beans, mangetout and dressing. Gently fold in the salad leaves. 3. Snip the cress from the punnet and sprinkle over the salad along with the sesame seeds and chilli. Toss together, divide among four bowls and serve.